PONT’s Ambulances team supports 34 motorbike ambulances, 30 bicycle ambulances and 90 mountain stretchers across Mbale region. We help 4,000 patients every year get the lifesaving help they need at a health centre or hospital. Our priority is women in labour or having maternal emergencies, children under 5 often with malaria and people who’ve had accidents. 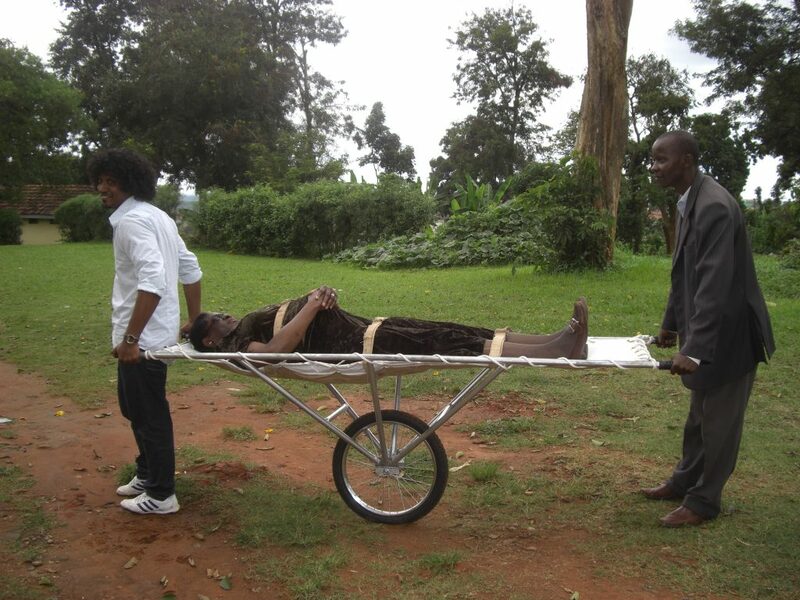 Before PONT volunteers visited Uganda, Mbale had no ambulance service at all. There are no doctors in most Ugandan villages. Many people in Mbale region live a long, difficult journey from the hospital or even from the nearest health centre and most people cannot afford to pay for transport. A grassroots approach was needed, so we started by training village health workers. We’ve gone on to train over 1000 health workers, sticking with these dedicated volunteers. Welsh Ambulance Service staff developed training that takes our village health workers to the level of qualified First Emergency Responders able to administer lifesaving first aid and recognise when further treatment is necessary. But when patients needed treatment at a health centre or hospital, the question was – how to get them there? Mbale is a mountainous area and roads are poor, especially in the rainy season. 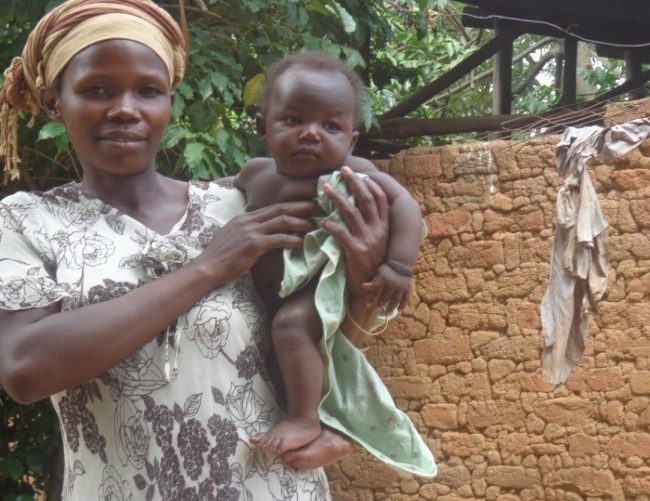 When Esther’s labour did not go to plan, she was grateful she could call on a motorbike ambulance – read her story. Watch: Godfrey is a Community Health Worker and Ambulance Driver– he tells us how his work is lowering maternal mortality rates. They navigate roads that cars and other vehicles can’t. They’re cheaper and easier to maintain in remote areas than cars. Each driver is trained in basic mechanics and they have access to the PONT workshop for more major repairs. They have space for a health worker to sit beside the patient to provide care and support, while a cover provides shade when the sun is hot and shelter when it’s raining. We began with just three ambulances in 2010 and expanded to a fleet of 34 in 2014 thanks to the support of Rotary District 1070. There are areas of Mbale that even the motorbike ambulances can’t reach. 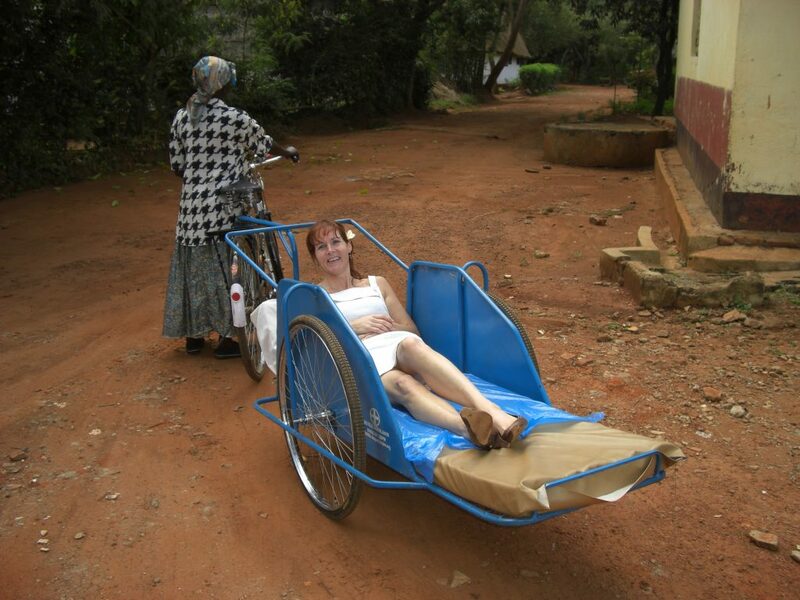 So we have also commissioned 30 bicycle stretchers, and 90 wheeled hand stretchers. We give health workers and motorbike drivers mobile phones, so the stretcher can often meet a motorbike at the nearest road. It’s these links that make our network effective. Ours is an integrated approach. As well as training health workers and drivers, our health links co-ordinators have trained staff in health centres to understand the volunteers’ roles and link up with them. Motorbike Ambulance drivers have become respected by health staff, and also by their communities. 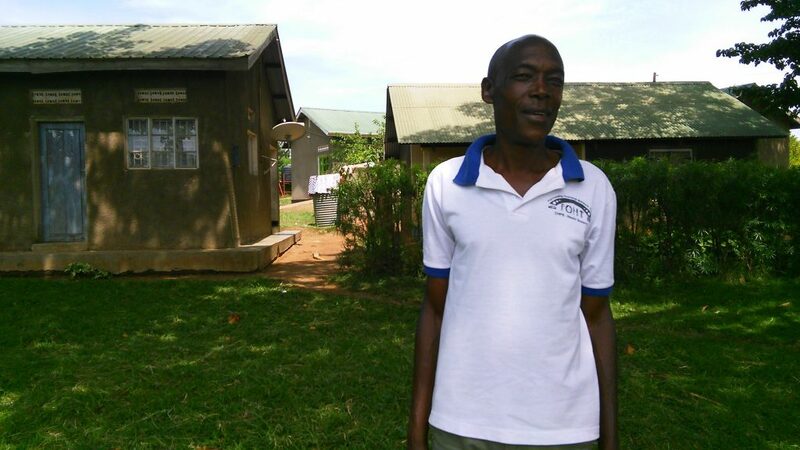 Many of them, like Jackson, started off as Village Health Team volunteers. They’re people who know and care about their communities, and are keen to be empowered to serve them better. PONT’s Ambulance project truly shows the power of partnership. Welsh Ambulance Service staff, PONT engineers and local people in Mbale are all working together and learning from each other, and it’s life-changing. Communities now know that if they have an emergency, there is someone who can help. We’re making 4,000 journeys a year. Each one might save the life of someone like Esther. Will you help us keep these life-saving ambulances on the road?